Meatpacking District: 50 Days after the original DOHing and three weeks after our last spot check, the ill-fated R&L Restaurant (fka Florent) is still closed. Bet the owner is reconsidering the her original notion of selling the space for retail right about now. The restaurant's signage still claims that it's a gas issue—remember the DOH shut them down for providing their own butane— but there has been a vital update. 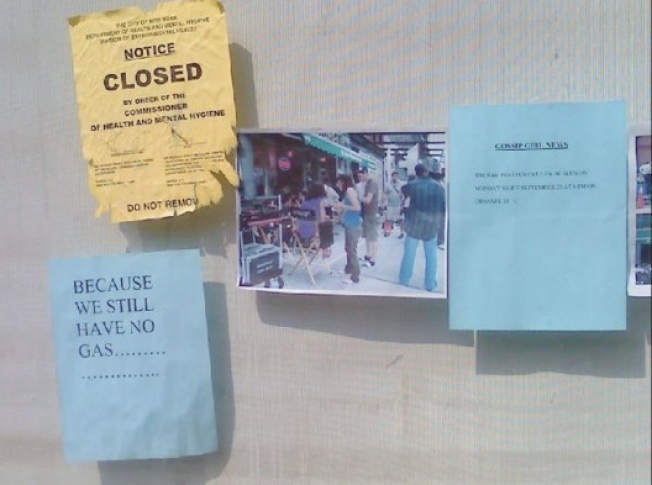 They're now reminding would-be guests that they were the recent location for a filming of Gossip Girl. Sadly, that won't help much with the DOH.